An Intersection Of Science And Art In Rembrandt's 'Anatomy Lesson' : 13.7: Cosmos And Culture The artist's painting of a medical school demonstration is more than just a picture; it is an occasion for thinking about the ways sight and thought, art and science, need each other, says Alva Noë. Rembrant's The Anatomy Lesson of Dr. Nicolaes Tulp. A couple of years back, my neurosurgeon showed me some snaps she'd made on her flip phone of my open forearm during a surgery she had performed on me. She offered me the pictures as evidence that her diagnosis that I had been suffering from an entrapment of the radial nerve had been correct. About a year later, I found myself sitting in another doctor's office, this time a neurologist. The surgery had not been effective. I had come to him for advice on whether it needed to be redone. He explained that he had good news and bad: The good news was that I didn't need another operation; the bad news was that I hadn't needed the first one either. The surgeon's diagnosis had been incorrect. What about the pictures she had shown me? I asked. His reply was curt: "You see what you want to see in that kind of picture." I thought about this as I stood before Rembrandt's 1631 painting The Anatomy Lesson of Dr. Nicolaes Tulp during my recent trip to the Netherlands. (The painting hangs in the Mauritshuis museum in The Hague.) 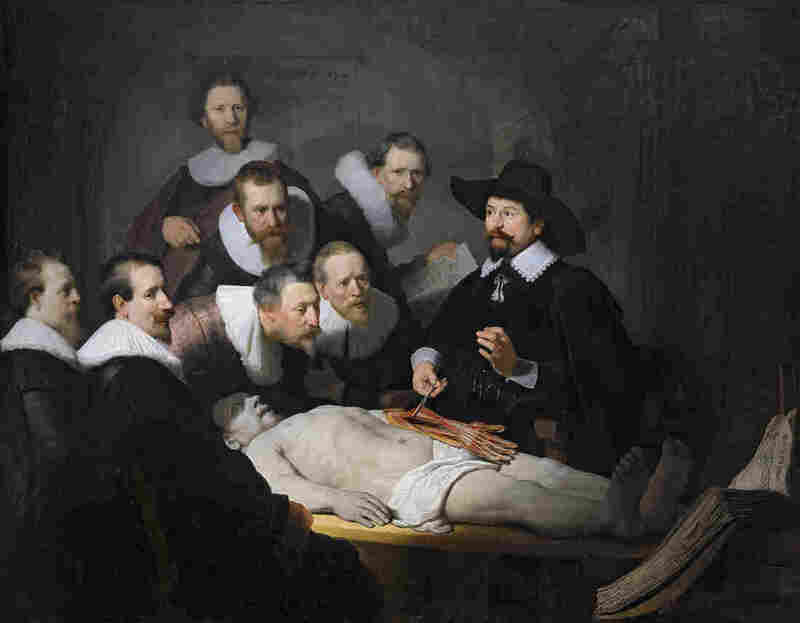 The Anatomy Lesson shows professor Tulp as he probes the anatomy of a cadaver's left arm with an instrument in his right hand, while, with his left hand, he demonstrates the movements of which the left hand is capable, and illustrates their dependence on that anatomy. The painting is gripping in a documentary sort of way. It presents an actual event — and was painted in a lecture theater in Amsterdam that is still in use at the university there. There is some dispute, I believe, about whether Rembrandt gets the anatomy of the dissected left arm of the cadaver correct. It takes knowledge to do so, of course. When it comes to cadavers, you can't just look and draw. You need to know what you see. This is true, even if it is also true, as my anecdote above reminds us, that false thoughts or misguided expectations can blind you to what is there (in my arm, for example, or in the picture of my arm). Rembrandt seems actually to explore this very issue in The Anatomy Lesson. We begin to appreciate this when we notice the care with which he depicts the doctor's students and, in particular, the way he illustrates what they are looking at, where their attention is directed. Two of them are staring straight out, at us or perhaps at the painter himself. A third has his mind on something or someone in the audience, it appears. But four of the students are engrossed in the demonstration. One seems to be looking at the teacher's face. At first, I thought the other three were looking at the cadaver under investigation. But, on closer inspection, their attention seems to be directed past the lifeless arm to a text book that rests open on a stand before them. Perhaps the book performs something like the role of PowerPoint today. As Dr. Tulp lectures and dissects, he refers them to graphical representations or verbal descriptions of the relevant anatomy and physiology. This a nice twist, and it gives the painting an epistemological weight that it would otherwise lack. These particular spectators focus not on the corpse, but rather on a representation, a rendition, on a picture book. Is this like opting for Cliffs Notes or watching the movie version? Perhaps. Plato may have believed something like this. We should turn away from books and pictures to know things themselves. But there is another idea — one with which Rembrandt may be experimenting — according to which there's no such thing as the direct inspection of reality; that is, there is no encounter with how things are that is not shaped or informed by our thoughts and pictures and, indeed, by our scientific theories. From this point of view, we can think of what is on display in The Anatomy Lesson differently: The students are not turning away from reality when they turn their attention to the book in front of them. They are using the books and images in order to see what is there before them. The book teaches them to see what is there by showing them what they are supposed to see. The book gives them the knowledge necessary for comprehending sight. In Rembrandt's painting, then, we meet a lovely epistemological circle: We need pictures (and books and theory) to assess the reality that alone provides us the means to verify and correct our pictures (and books and theories). And this goes for what Rembrandt is doing, too. To make a convincing painting of the anatomy lesson, Rembrandt must be able to see it, to really see it. But as he himself shows in his picture, you need books and more pictures, in order to do that. Rembrandt's painting of a scientist at work is also an argument for the irreducible importance of art to the scientist's basic project. There is no science without art.